Having used Advance Devices Smart Tweezers for several years, I was surprised to find what appeared to be a clone in a local electronics store for about $30. They were designed by Chinese company, Artech, as their Model VC6015. I decided to purchase them and compare with the newest Smart Tweezer Model ST5. 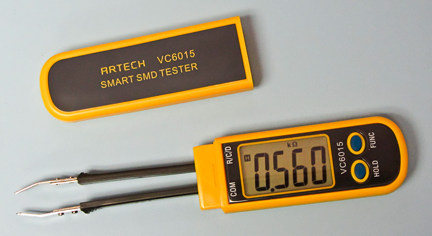 The Artech VC6015 RC (doesn’t measure L) meter clone. The first thing I noticed was the clever slide-on protective cover around the tweezers. My impression went downhill from there. The nickel-plated tweezer tips were not aligned well and I had to bend them straight. They had trouble grasping the smaller surface-mount parts, but worked OK on 0602 size and larger. The unit is powered by a CR2032 Lithium battery. Whoa, I next noticed it doesn’t measure inductance; just resistance, capacitance and diodes – a major drawback. Also, the display can’t be oriented 180 degrees for us left-handed users. Otherwise, the resistance and capacitance measurements were pretty accurate (see charts in the main article). The auto range worked well, but was slower than the Smart Tweezers. Also, the ranges were more limited, which reduced the accuracy of the smaller component values. The Hold button was useful to freeze the measurement. The meter fits OK in your hand, but I had to learn to read the display upside down. The Auto ranging worked well, but was slow. The Hold button would allow me to flip the unit around to read the measurement. Pressing the Func button would switch from the Auto measurement to only C or R, but with slightly wider measurement scales. While the resistance and capacitance measurements seemed pretty accurate, the tweezer tips were a little fiddly when measuring very small surface-mount devices. The lack of an inductance measurement was a show-stopper for me. The Artech Model VC6015 is available for about $30 and may be ordered through local dealers. Their Web site is: http://www.artech-instruments.com. This entry was posted in General, Reviews and tagged RLC meter, test equipment. Bookmark the permalink.